It has been almost 90 days since the BRD token sale, and the team has been very busy. We’d like to take a moment to share with you some of the accomplishments thus far, and let you know what’s in store in the near term. In addition, we’re excited to announce that in April, we’ll deliver tangible benefits to BRD token holders who retain enough tokens to qualify for Tiers 1, 2, or 3. More details are available on the Rewards Waterfall program here. The BRD app has now surpassed 1M downloads globally. Higher than average monthly active users (MAU), with one of the most loyal user bases of any crypto app. Revenues up several hundred percent. Created a foundation to enable other companies to conduct token sales via BRD, resulting in a revenue opportunity. Launched global “Buy Bitcoin” feature with high-limits ($20,000 USD) and same day delivery, often in just minutes. Released full BCH support, giving users access to coins from the August 2017 fork. Released initial SegWit capability supporting the ability to send BTC to bech32 addresses, and laying the foundation for full SegWit functionality going forward. Launched the BRD Ambassador program with “Bakers” who promote the app, create educational videos, and moderate Telegram channels. Unified the brand, bringing “Bread” and the “BRD token” closer together under BRD: Banking, Reinvented, and Decentralized. Finalized multi-currency support to scale the app to hundreds of tokens and other digital assets. Performed countless bug fixes, optimizations, and QA process improvements based on user feedback. Thank you for your suggestions! Our distributed development team is working around the clock to bring you new features. In order to serve our customers better, we’ve adopted a regular release cycle whereby we will have an update to the app stores on both iOS and Android the first full week of every month. The next release is targeted for the first week of April, when the app will fully support Ethereum, in addition to bitcoin and bitcoin cash, all decentralized. In April, ERC-20 token functionality will be made available exclusively to our current beta testers who are holding ETH and BRD, a group that is now closed to new applicants. We appreciate our most loyal users and want to enable them first access to these new features. We know you are waiting patiently for full ERC-20 support, and that it is a highly anticipated feature. We feel the same. Internal testing is underway, and the new version sports a beautiful and intuitive portfolio interface, with detailed currency views for each asset. Security and privacy are fundamental tenets of our product. Since over a million users entrust us to help them protect their money, we refuse to take shortcuts and will always put our customers’ security and privacy first. We categorically will not release updates before the code has been thoroughly vetted and battle tested. It is critical that BRD remains a trusted sanctuary for digital assets, particularly amidst daily news of hacking and lost funds. No cryptocurrency has ever been lost in BRD due to a hack. This distinction is rare in this industry. When you use BRD, you are bulletproofing your finances, but not just from thieves, also from prying eyes. Unlike the vast majority of crypto wallets, we do not run your bitcoin transactions through our servers and have no visibility into your balance or history. 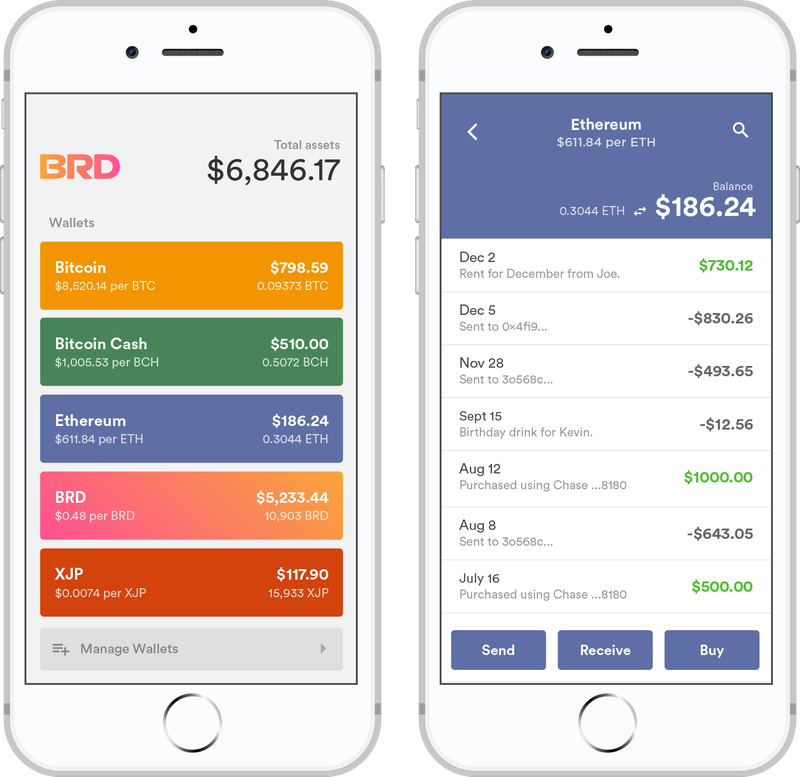 If you value your privacy, you should only use a wallet that connects directly to the blockchain, like BRD. We’re staking our reputation on the ability to deliver real value to our customers through our rewards program, and although the full native implementation is forthcoming, for the month of April, we are pleased to announce that we will begin our Rewards Waterfall program and provide benefits to large holders of BRD tokens. For users in Tiers 1, 2, and 3, corresponding to those who hold 25,000 BRD tokens or more in a single wallet, we will be reimbursing all transaction fees when using our “Buy Bitcoin” features. That’s right: fee-free bitcoin for a whole month! Participation instructions are forthcoming. But this is only the start. Once the Tiers are fully enabled in the app, other perks will follow, and continue indefinitely as we build the resources to give token holders as many reasons as they need to keep using BRD to manage and store their digital assets. To celebrate the release of full Ethereum support the first week of April, we will be orchestrating an airdrop. Stay tuned for details! In the meantime, we would like to thank our loyal users. We have set a long-term and ambitious goal to be the world’s largest decentralized financial institution, and we continue to work hard everyday to make it a reality. In future AMA’s and videos, you will be able to meet members of our executive and development teams. We’d love your feedback, and are here to serve you.